In some previous discussions, the issue of global population growth and the over use of planetary resources has been raised along with the suggestion that the growth in population is now one of, if not the most, fundamental problem facing humanity. However, the development of the discussions under the heading of ‘The Evolution of Economics’, inclusive of the section called the ‘Limits to Growth’ highlighted the potential effects of population growth on the global economy and wealth distribution. Therefore, the goal of this section of discussions is to try to review the wider debate surrounding the impacts of an increasing global population on planetary resources in order to get a better understanding of some of the arguments, both for and against. 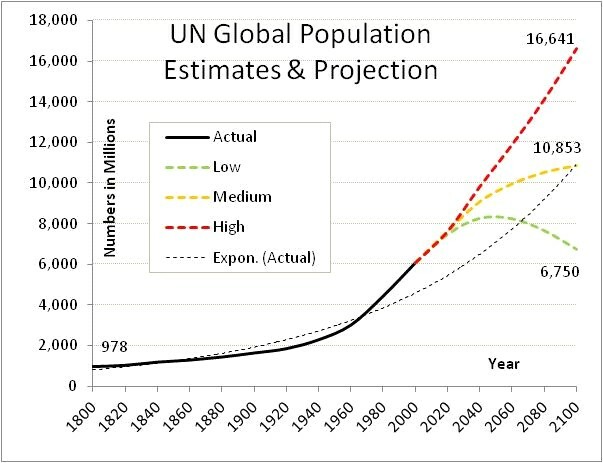 Today, in 2015, the population clock currently shows a figure of 7.3 billion, while the graph below, based on figures collated by the United Nations, shows how this figure might be compared within the timeline: 1800-2100. Obviously, the plots extending beyond 2015 are projections, which are said to be based on 3 different fertility assumptions, where the ‘medium’ projection appears to coincide with an exponential extrapolation of the ‘actual’ curve between 1800-2000 in that they both arrive at a figure of 10,853 billion in 2100. In contrast, the ‘low’ and ‘high’ projections result in a global population ranging anywhere between 6,750 and 16,641 billion by 2100. While the high projection might appear alarming in terms of the potential environmental and resource usage impact, we might also need to understand the implications of a falling global population on the economy, which may be subject to much regional variation. But surely more people must use more resources? 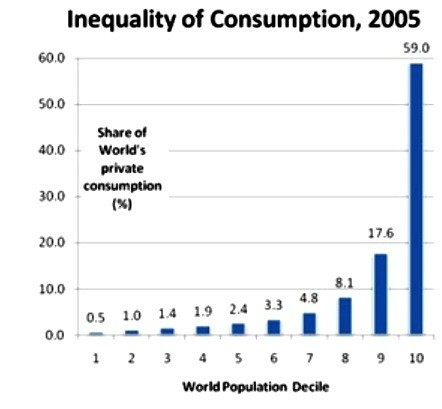 While increases in the global population will undoubtedly lead to further problems, the critical issue of over consumption of planetary resources may be a more complex, when the distribution of resource consumption is analysed in more detail. 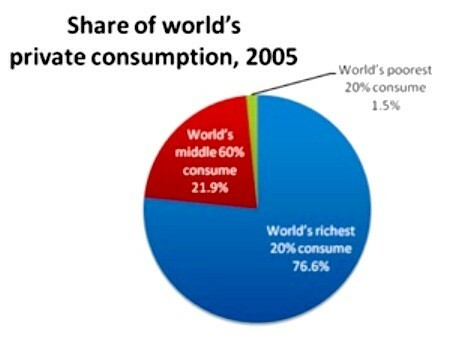 For example, statistics suggested that the wealthiest 20% of the world accounted for 76.6% of total private consumption, while the poorest 20% used just 1.5%. Urban sprawl is destroying millions of acres of farmland. Over 1 billion people do not have enough food or safe drinking water. Increased demand for resources is leading to increased deforestation. Traditional energy sources are becoming scarcer and more expensive. Current use of traditional energy sources exacerbates global warming. Global warming is now threatening the entire global ecosystem. Environmental change is threatening to displace millions of people. Growing resource demands increases competitive tension between nations. Therefore, this section of discussions will attempt to research, and further consider, the implications of a growing global population over the next century in the context of a number of wider issues, e.g. Ideological tensions, political, economical and theological. Overview presentation of the discussion of population versus resources. The PDF version of the discussions in this section has been created in order to help wider distribution and review. Pressures resulting from unrestrained population growth put demands on the natural world that can overwhelm any efforts to achieve a sustainable future. If we are to halt the destruction of our environment, we must accept limits to that growth. Can you think of any problem in any area of human endeavor on any scale, from microscopic to global, whose long-term solution is in any demonstrable way aided, assisted, or advanced by further increases in population, locally, nationally, or globally? The point of population stabilization is to reduce or minimize misery. Somewhere on this globe, every 10 seconds, there is a woman giving birth to a child. She must be found and stopped. Somewhere on this globe, every 0.25 seconds, there is a woman giving birth to a child. She must be found and stopped. While somewhat pedantic, it does better reflect a 40 fold increase in the actual birth rate and the focus of this section of discussions.